LaMa Studio was founded in 1995 in Great Titchfield Street, W1, London, based on projects in the UK, Germany and USA. From the outset, Directors pursued opportunities arising from their teaching and research at the Architectural Association. LaMa design theory is based on a rejection of modernist dogma in favor of sustainable pattern making, as observed in nature. LaGess had previously worked with Moshe Safdie and KPF while McNamara had been an assistant to Lord Rogers in the early days of Thames Wharf Studios. Both had begun their UK careers in 1988 working on competitions and buildings in the office of James Stirling and Michael Wilford. Several years’ experience with established architects allowed the new firm to attract a commission from HMV for a flagship shop in Milton Keynes, UK. The completion of the £1M shop in December 1995 on time and on budget was marked by special praise for the creative use of images, detailing, and materials. HMV soon offered LaMa a repeat commission for ‘listening post’ innovations to be deployed across HMV shops worldwide. Early success with a large client attracted further commissions, competitions, and teaching opportunities, allowing LaMa to develop rapidly through the late 1990’s. Each client experiences a collaborative working relationship and frequent communication since both Directors work on every project. As the Directors continued to develop their skills with commissions for offices, urban plans, and London residences, LaMa received more international attention. They were invited to lecture frequently in the UK, as well as Europe, Asia, and USA. Early in 2001, LaMa concluded their work at the AA to take up teaching positions at Harvard, Cornell, and the University of Texas at Arlington in the USA. Directors were able to return to their roots in generative architectural practice by participating in a series of ‘master classes’ with Professor Emeritus Elinor Evans of Rice University who taught the groundbreaking Basic Design course [in part based on her teacher, Josef Albers. See Interaction of Color which remains a key design theory text]. Evans’ early contact with Louis I. Kahn at Yale and his teaching at Rice provided another essential influence. Re-settled in West London in 2003, the LaMa Studio has used generative principles to design a series of house and flat commissions, mid-sized commercial offices, and its own small-scale residential and commercial property investments. LaMa Studio creates value for its Directors and clients based on solid architectural and social values. 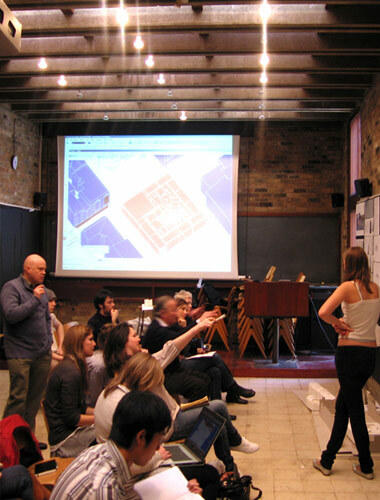 LaMa was subsequently invited to teach a generative design studio at the University of Cambridge Department of Architecture in 2006-07. LaMa’s generative design expertise is now fully grounded in the practical process of making buildings. LaMa has an excellent track record of success in working with government, regulatory, and planning authorities to gain all required approvals including permitted development, planning permissions, and building regulations approvals. LaMa has experience in all RIBA phases of building procurement, from initial brief through tendering and construction, and finally, client hand-over.